National Geographic reports that scientists in Vietnam have discovered a new type of bat. With his beady eyes and strange nose, this guy struck me at first as weird or scary or monstrous. But the more I learn about him, the more beautiful he becomes. 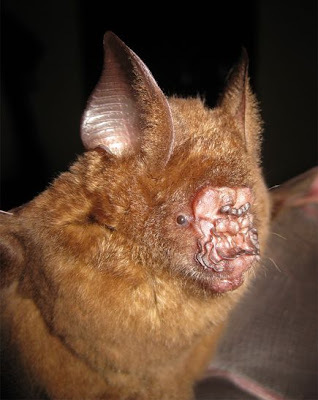 According to scientists, the “leaf-nosed” facial protuberances serve as both transmitter and antenna, apparently playing a role in echolocation. Good thing the eyes are so tiny; they might not mate if they could see each other! As a biologist, it distresses me when people can only see "ugly" or "pretty" in animals. If you study the features closely in this bat, you begin to see that they are intricate and symmetrical -- not just a hodgepodge of deformed flesh. Such natural patterning suggests a fascinating evolutionary history and further study would probably show some amazing echolocation functions they provide. But (sigh) the internet seems to encourage thoughtless exclamations of first impressions, instead of thoughtful consideration. if an artist wants to become good at making up imaginary creatures, surely nature provides -- literally -- a world of inspiration? Perhaps one day they will evolve to a point where they can laugh about how ugly humans are without traumatizing themselves over silly PC issues. Thanks for posting this! Bats are vastly underappreciated, unfortunately, except by film designers looking for yet another look for vampires. This reminds me of Richard Dawkins' book The Blind Watchmaker. He discusses how creatures which use echolocation, like dolphins and bats, could potentially send 'mental images' to each other by imitating the sound that an object made when echolocated. I believe he even brings up the idea that sentient beings which rely on echolocation could make 'sound sculptures' that convey mental images when echolocated. Perhaps in the same way that we find line quality, value, and light to be visually stimulating, they would find curves, textures, and shapes stimulate their sensory organs in the same way. It would be fascinating to find that some unknown species of dolphins or bats make visual art by sculpting strange shaped objects which make interesting sounds when echolocated. Human beings would be virtually incapable of understanding how the artwork communicates since we lack echolocation. Huxtible, you're right, and I think we're just beginning to discover all the subtle modes of communication that we never realized were going on before. Terry, I think that's what I'm saying--understanding helps us to see past those first reactions. But you have to understand how someone without a deep knowledge of such a creature's complexities will respond emotionally and immediately in basic terms. Even when one intellectually appreciates, for example, the biology of a wasp that lays its eggs in living pupae of other insects, it's only "human" to recoil, and it wouldn't be honest to ignore those feelings. Its the mechanical side of art that i'm most comfortable with and find most interesting. The creative side I stuggle with and i'm only starting to get used to. I think articles like this help get my creative juices flowing to come up with ideas. You've inspired me to borrow a few of my dads old National Geographic mags. From now on i'm going to force myself to spend a little time each day to read them! I'm actually fascinated by bats. They're so weird looking I can't help but admire them. Human noses are pretty weird as well.